La Jolla Shores restaurants: The juice bar at Everyday California is the new kid in the neighborhood. La Jolla Shores restaurants have a special place in my heart – and not just because they’re walking distance from our house. What I really love is their casual, beachy atmosphere. 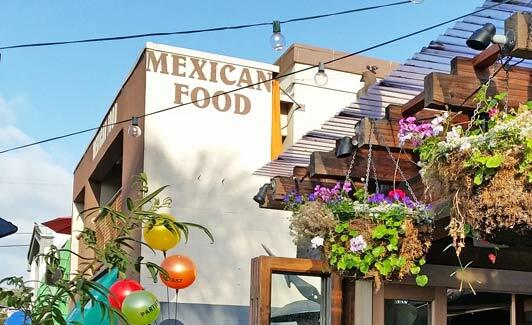 San Diego tourists tend to dine a mile away on Prospect Street (AKA “restaurant row”), but locals and authentic travelers prefer the neighborhood feel of La Jolla Shores restaurants. If you took Spanish 101, you know that Avenida de la Playa leads to the beach. Along this three-block route between La Jolla Shore Drive and La Jolla Shores Beach, you’ll find several places that rent snorkel gear, kayaks, SUPs, and surf boards, as well as offer lessons and small group tours. 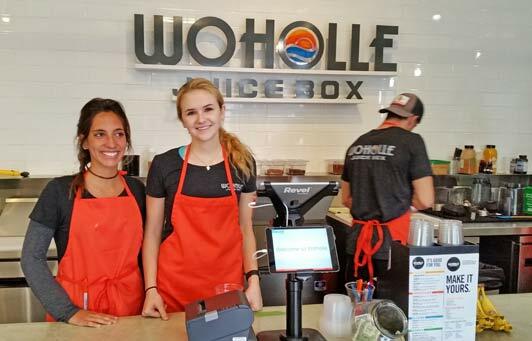 One of these, Everyday California, has also just added Woholle Juice Box, a super fun juice bar where you can create yummy fruit drinks, smoothies, elixirs, and bowls. It’s the perfect place to quench your thirst after a few hours on the water or a big beach walk. La Jolla Shores restaurants also include two very different Mexican food choices. 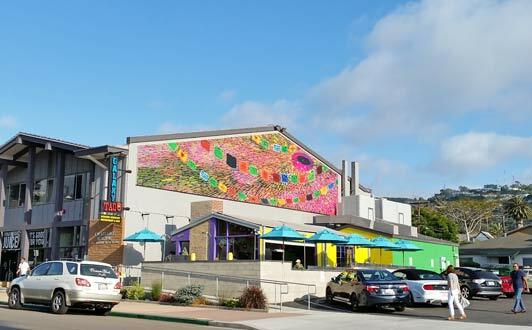 Galaxy Taco , owned by Trey Foshee of Georges at The Cove on Prospect Street, is right next door to Everyday California. Here you’ll find a sleek and sophisticated setting (nary a sombrero in sight) in which to enjoy house-made tortillas, a variety of tequila-based drinks, $6 tacos, and high-end Latin choices including Birria Steamed Clams. El Charro serves Mexican fast food a couple of blocks from La Jolla Shores Beach. On the same side of the street but down a block, El Charro is low-brow and beachy. The counter-service menu includes typical Mexican-American fast food items, including $3 tacos and grande fish burritos. Both Galaxy Taco and El Charro offer inside and patio seating and garner the same number of Yelp stars. The choice is yours. What would I do without Shorehouse Kitchen? Since it opened a couple of years ago, this (mostly) open-air bistro with the super-friendly staff has become my go-to place to eat. I love that they serve breakfast until 2:30pm because it gives me more time to enjoy the amazing cornmeal pancakes with blueberries and lemon yogurt. And lunch? I vacillate between ordering the tarragon chicken salad with cranberries, avocado, and pistachios on a bed of greens vs. wrapped in a flour tortilla. It’s always a tough call. 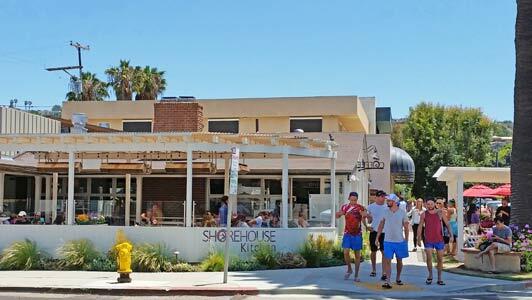 Shorehouse Kitchen is a popular spot for weekend breakfasts. Shorehouse Kitchen is so popular that I don’t try to eat there for breakfast or lunch on weekends, but I do walk by on my way to the beach and marvel at the number of people waiting for a table. This place is very pet-friendly – they even provide a wooden dog house so that man’s best friend doesn’t have to stand around in the sun. A few nights ago, my husband and I zoomed into Shorehouse Kitchen for a last-minute dinner and found ourselves sharing the patio with one young couple, an older gentleman, and his very large dog. The staff was equally courteous to all of us – and brought the four-legged guest a bowl of water as well as the treats his owner ordered off the doggie menu. That night’s meal was memorable for several reasons. First, the sautéed shrimp and seared gnocchi with honey cured bacon was positively divine. Then there was the fact that the weather was perfect for sitting outdoors – and the waiter was kind and funny and smart. But mostly I just remember thinking how lucky we are to have a neighborhood eatery like the Shorehouse Kitchen with walking distance of our house. In these times, when text messages pass for human communication and “customer service” is provided by robots, this place – more than any of the other La Jolla Shores restaurants – is providing food for our souls. Check back for La Jolla Shores Restaurants, Part 2, profiling three very special Italians. Coming soon. I promise. 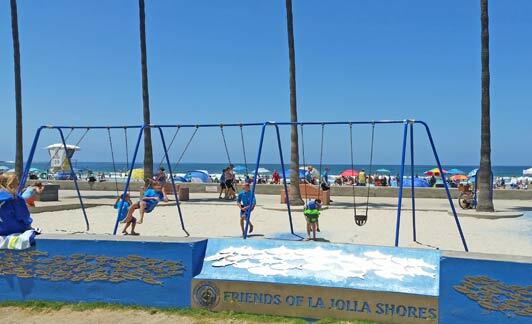 At La Jolla Shores Beach, a popular playground is just steps from the sand.